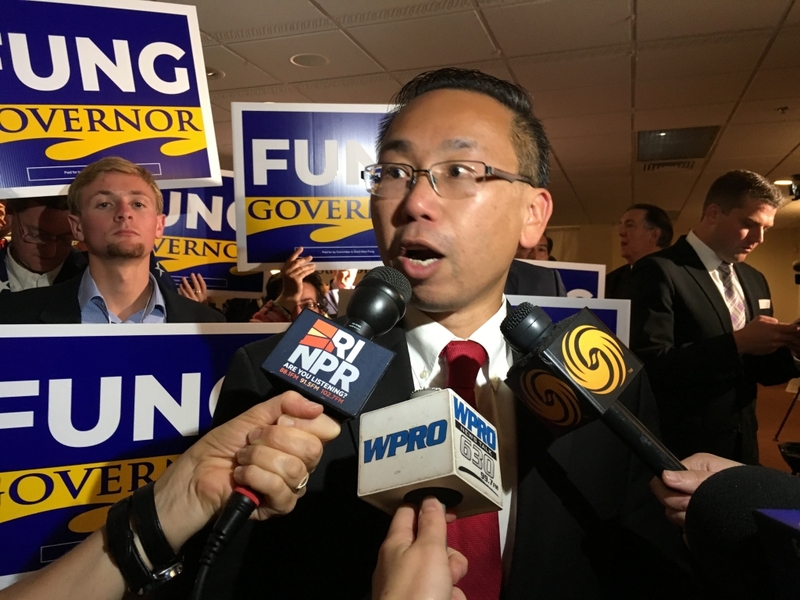 Mayor Allan Fung speaks with reporters after his 2018 primary win. Photo by Tessa Roy, WPRO News. Governor Gina Raimondo has widened her lead over Republican challenger Mayor Allan Fung in the latest WPRI/Roger Williams University poll. Raimondo stands at 43%, Fung at 36%, and Independent Joe Trillo at 7%. Trillo, according to pollster Joe Fleming, could be a roadblock to a Fung victory as Trillo’s supporters are already unlikely to vote for Raimondo. Fleming tells WPRO’s Dan Yorke that among Trillo voters, 68% view Raimondo’s performance as poor and 25% view her performance as fair. Fleming noted that Fung’s numbers are relatively unchanged, but added it’s uncertain if Raimondo’s numbers can go any higher. “He’s stayed at about 36% in every one of our polls, so he also has to get moving. The question is how high can the governor go, and the conventional wisdom is she can’t go higher than 44, 45%,” Fleming said. Fung’s campaign argued Raimondo’s numbers still aren’t good enough to guarantee her another term. Trillo said he doesn’t believe the poll and is staying in the race. “We’re a week out of the primary. The people haven’t even got their breath yet. When did he take this poll? Primary night? Or did he take it 2 or 3 days before the poll?” Trillo told Yorke. Raimondo’s team reacted positively to the poll. Listen to “Eyewitness News Political Analyst and pollster Joe Fleming discusses the brand new data released on the Gubernatorial and Senate race in RI” on Spreaker.